Introduction: In the course of time many tehniques were recommended for the removal of the root canal filling with different efficiency, time- and work exaction. The aim of this study was to evaluate the efficiency of three different methods used for guttapercha cone and sealer removal during dezobturation. 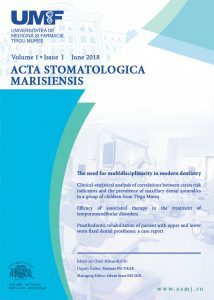 Materials and methods: 63 extracted incisors after root canal preparation were filled using sealer and gutta-percha cones. After 1 week the obturation was removed using three different techniques. Teeth were sectioned to estimate the efficiency of the techniques. Preparation time was also measured. Statistical analysis was performed, at a value of p<0.05. Results: Visual analysis showed a more efficient cleaning of obturation when ProTaper files were used, although statistical analysis showed no differences between hand files, hand and rotary file combination and ProTaper files efficiency. ProTaper files dezobturated the canals in shortest time. Conclusion: ProTaper are recommended for root canal filling removal.